Yesterday, I did some scientific research at my desk. I know you think because I graduated with a Liberal Arts degree, I do not know a lot about science, but you are wrong. 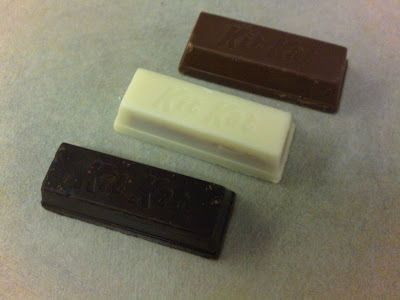 Using deductive reasoning, I set out to discover which flavor of bite-sized Kit Kats was the best. Truthfully, this test wasn't all that scientific because it was laced with bias. The dark chocolate had it wrapped up before I even started. I would eat a number 2 pencil, eraser and all, if it were coated in dark chocolate. 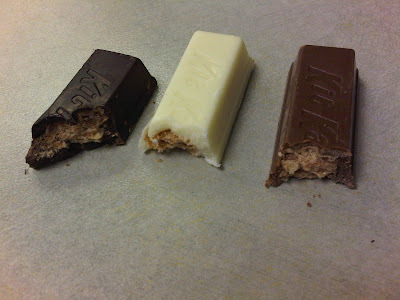 Here we have, from top to bottom, a regular milk chocolate Kit Kat, a white chocolate Kit Kat and a dark chocolate Kit Kat, straight out of the bowl of holiday candy on my coworker's desk. Whaddya know? The dark chocolate one looked the best. Next up, taste. I sampled each one a few times, taking tiny bites and cleansing my palate in between each bite. The white chocolate was my least favorite - the white chocolate was too thick and chalky and it felt like it wouldn't leave my mouth. Milk chocolate was next, and WAIT FOR IT - dark chocolate won! So, therefore, the dark chocolate bite-sized Kit Kats... and dark chocolate everything... wins! Whew. Glad that's outta the way. That's enough science-talk for one year, don't you think? Dark chocolate may be one of the worst things I've ever tasted. EVER. As I sit here reading this post, I am eating a giant bag of Dark Chocolate Chex Mix...WHO KNEW!!!??? It is awesome if you haven't had it!! I'm intrigued... I am a die-hard milk chocolate Kit-Kat fan, but it appears that I just haven't given the dark chocolate version a chance. I'm here to tell you that I did the same thing at my office and tried all three. I also agree that dark chocolate is by a LONG shot the best. It's so good that you don't ever want to taste another milk chocolate Kit-Kat ever again.